St Lawrence String Quartet violinist Geoff Nuttall is now in his ninth year as director, curator and host of Sopleto’s chamber music program, a format that sees a wealth of American and international talent perform 11 programs, three times each, over the two-and-a-half weeks of the festival. Nuttall’s boundless enthusiasm is pretty infectious, and he functions as both gifted musical partner and ebullient emcee. Bite size concerts, morning and afternoons, weigh in at an hour and a quarter and go down easily thanks to savvy programming and world-class musicians. My first featured a pair of songs by Rachmaninov, Schoenberg’s Verklärte Nacht and music by Doug Balliet, this year’s composer-in-residence who also happens to be a double bassist and writer with a weekly show on New York Public Radio (multitasking is clearly a must at Spoleto). Not only did we get the world premiere of Balliet’s quirky Fanfare for Trombone, Double Bass and Bass Clarinet once, Nuttall bounded onstage afterwards and commanded a repeat performance and a second aural bite of a fairly toe-tapping morsel. 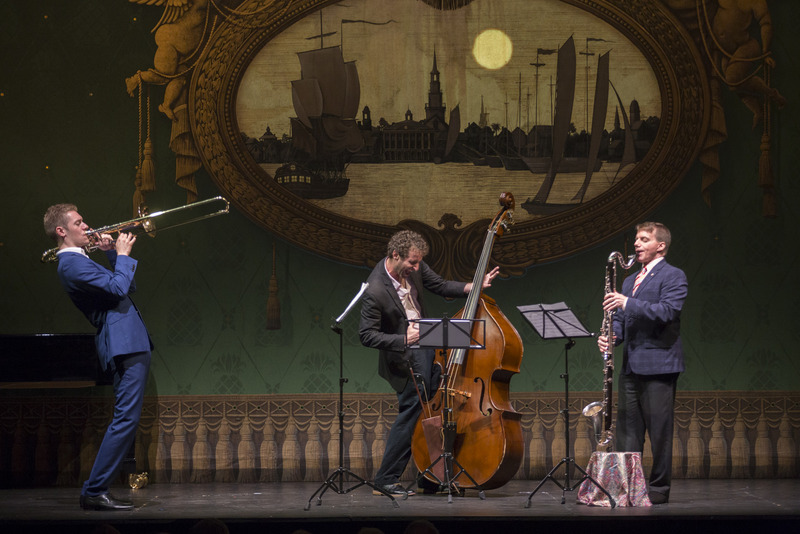 Three of the orchestra’s musical pachyderms fairly pirouetted through a jazzy showstopper that quotes one of Balliet’s own works as well as Haydn’s Emperor Quartet (better known as Deutschland, Deutschland über alles). Eloquent American tenor Paul Groves was in fine form in the Rachmaninov, quipping that “opera is never nearly as much fun” as chamber music – “mostly because we have conductors!” Wonderfully old-school, and singing with a showman’s unashamed passion, his ringing top notes were a thing of wonder, as was the raptly floated conclusion to When Night Descends. Nuttall was the companion soloist in what were Kreissler’s arrangements originally intended for John McCormack, though the violin tone was somewhat swamped by Groves’ more ample instrument. Baillett’s Three Barizo Songs were picked from eight that make up Swoon, J. Mae Barizo poetic, feminist response to Schumann’s Frauenliebe und Leben. Barizo’s witty, yet acerbic texts inspired angular settings from Baillet with strings creaking and squawking in the third, ironically entitled Noose. Groves’ performances were engaging enough, but a female voice would have surely have been preferable? No quibbles about Verklärte Nacht, which received a radiant performance from Nuttall and Owen Dalby on violins, Meena Bhasin and Masumi Rostad on viola, and Joshua Roman and Nina Lee on cello. Written at a time when love was very much on the composer’s mind, the sextet is a musical re-enactment of a Richard Dehmel poem about two lovers, a dark secret and an eventual reconciliation ending in a starry, starry night. 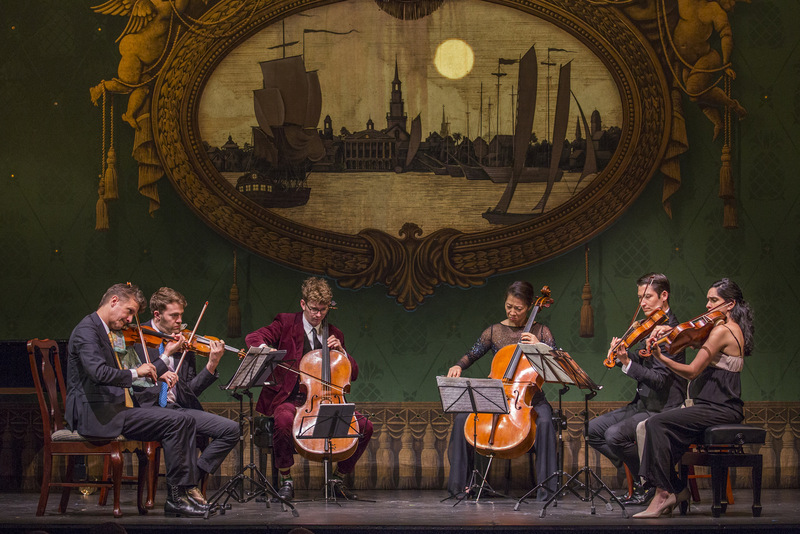 From the hushed opening, through the impassioned early passages and on through the blossoming romantic transfiguration to the music’s glittering conclusion, the players were tight, focussed and deeply communicative. Nuttall and Lee were notably expressive, but this was a superb team effort that earned a well-deserved standing ovation. 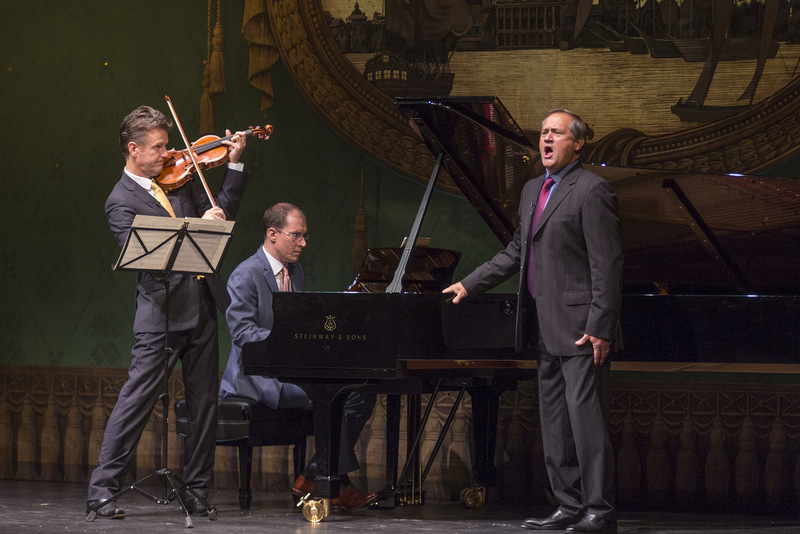 The series finale contained works by Beethoven, Gounod, Donizetti, Vivaldi and Freddie Mercury – yes, you heard me – but kicked off with a genuine rarity: Schubert’s Gesang der Geister über den Wassern (Song of the Spirits over the Water). One of Goethe’s more profound utterances on the nature of the soul, it found the men of the Westminster Choir on top form in what is a difficult, multi-sectioned work. Accompanied by string quintet, the choir’s confident manner conveyed a palpable sense of communicative brotherhood and featured some beautifully floated tenor lines. In Beethoven’s C Major Cello Sonata – an early late-period work that alternates lyrical and dramatic passage as it traverses a restless emotional journey – cellist Joshua Roman and Gilles Vonsattel on piano may have steered clear of its darker depths, but theirs was a fine shapely reading. Emotional commitment never seems to be a problem for Paul Groves, no matter the hour. Though not exactly a French tenor in terms of sound, he nevertheless gave all he’d got in Todd Palmer’s neat chamber arrangement of Gounod’s Salut! Demeure chaste et pure, nailing the top note at approximately 11:20am! The crowd were equally delighted by Una furtiva lagrima, though Groves naïveté-light interpretation rather milked the emotion. A spirited account of Summer from Vivaldi’s Four Seasons saw Livia Sohn the lively soloist. And what can one say about an arrangement for operatic tenor and ensemble of Freddie Mercury’s Who wants to live forever, complete with cheesy 1980s video set candles, comedy surtitles and – horror of horrors – a sing-along section? It’s either going to make your day or haunt your dreams. All I will say is that Paul Groves (in Nuttall’s words, “the greatest karaoke singer on Earth”) is nothing if not a good sport!